This shows lewy bodies. Brown spots are immunostaining using an antibody specifically recognizing an abnormal form of alpha-synuclein. 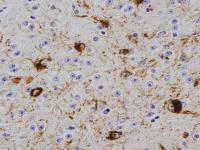 Clumps of α-synuclein protein in nerve cells are hallmarks of many degenerative brain diseases, most notably Parkinson's disease. "No one has been able to determine if Lewy bodies and Lewy neurites, hallmark pathologies in Parkinson's disease can be degraded," says Virginia Lee, PhD, director of the Center for Neurodegenerative Disease Research, at the Perelman School of Medicine, University of Pennsylvania. "With the new neuron model system of Parkinson's disease pathologies our lab has developed recently, we demonstrated that these aberrant clumps in cells resist degradation as well as impair the function of the macroautophagy system, one of the major garbage disposal systems within the cell." Macroautophagy, literally self eating, is the degradation of unnecessary or dysfunctional cellular bits and pieces by a compartment in the cell called the lysosome. Lee, also a professor of Pathology and Laboratory Medicine, and colleagues published their results in the early online edition of the Journal of Biological Chemistry this week. Alpha-synuclein (α-syn ) diseases all have clumps of the protein and include Parkinson's disease (PD), and array of related disorders: PD with dementia , dementia with Lewy bodies, and multiple system atrophy. In most of these, α-syn forms insoluble aggregates of stringy fibrils that accumulate in the cell body and extensions of neurons. These unwanted α-syn clumps are modified by abnormal attachments of many phosphate chemical groups as well as by the protein ubiquitin, a molecular tag for degradation. They are widely distributed in the central nervous system, where they are associated with neuron loss. Using cell models in which intracellular α-syn clumps accumulate after taking up synthetic α-syn fibrils, the team showed that α-syn inclusions cannot be degraded, even though they are located near the lysosome and the proteasome, another type of garbage disposal in the cell. Page took 0.016619 seconds to load.